Join us on a guided day tour as we explore Carver County, Minnesota, home to one of the largest open-air galleries of art and barn quilts. Made for barns, not beds, “barn quilts” are quilt patterns, drawn to scale and painted on wooden panels that are hung on exterior walls of historic barns. These beautiful pieces of artwork highlight the art of quilting while showcasing Carver County’s historic agricultural icons. Impressive in size they measure 8’x8’ and weigh approximately 250 pounds. With 25 blocks on display, the tours can be progressive in nature, allowing guests to view eight to ten quilts per tour, showcasing different quilts each time. Three different guided tour routes, appropriately named, are available, as well as customizable tailored tours. Let our tour host help plan your tour today! Other attractions include local stops at area wineries, breweries, a distillery, orchards, creameries and Quilt Shop. With a local step-on-guide, you’ll also learn about the history of Carver County, the farms, and the story behind the choice of each quilt pattern. 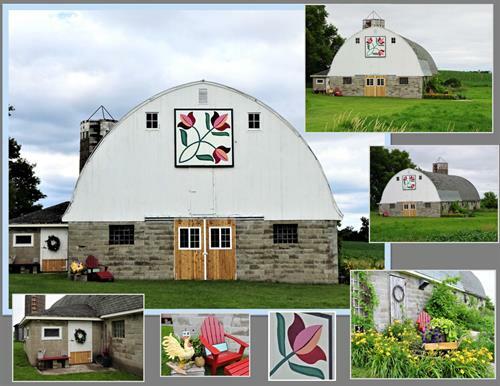 The barn quilts are a permanent display of artwork and part of the fabric of our community. Located just 30 minutes west of the Twin Cities, we invite you to spend a day with us to visit our open air gallery of art while touring the beautiful city and countryside of Carver County, MN.